There’s always a right time for everything - right time to sleep, to wake up, to eat, basically everything! But there’s one thing that sees no time - snacks! C’mon you’d have to agree that a pack of chips is the most tempting thing in the world, you’d have a few even if you’re full. A choco-chip cookie, a bar of your fave chocolate, a can of bubbly soft drink and stuff like this make us weak in our knees and everyday as soon as we leave our college or office or school we rush to the nearby chips store and pounce on these goodies. But let’s not be in denial, we can’t ignore how these calorie-enriched, diabetes-laced and fat-producing snacks are killing our bodies slowly. Obviously, the urge to hog on something every evening doesn’t end, so we have just the thing for you - Unsnack! Understanding the urge to snack but also the need to maintain our diets and health, these people have some of the most yummy yet healthy stuff that you can gorge on guilt free! Snacks, from the earliest of times, were basically small meals that’d boost your energy levels and help you get through the day&apos;s work! But now-a-days, snacking has become entertainment! We eat ‘cause we got nothing else to do, we gobble up junk when we’re studying late at night, we eat chocolate bars while we’re travelling, we eat just because! But let’s take a moment to realize that our age-old habit of unhealthy munching has lead us to become decidedly unfit and as they say, it’s never too late to start afresh and the peeps at Unsnack have just what you’d need to keep your mouths munching and yet your bodies healthy! 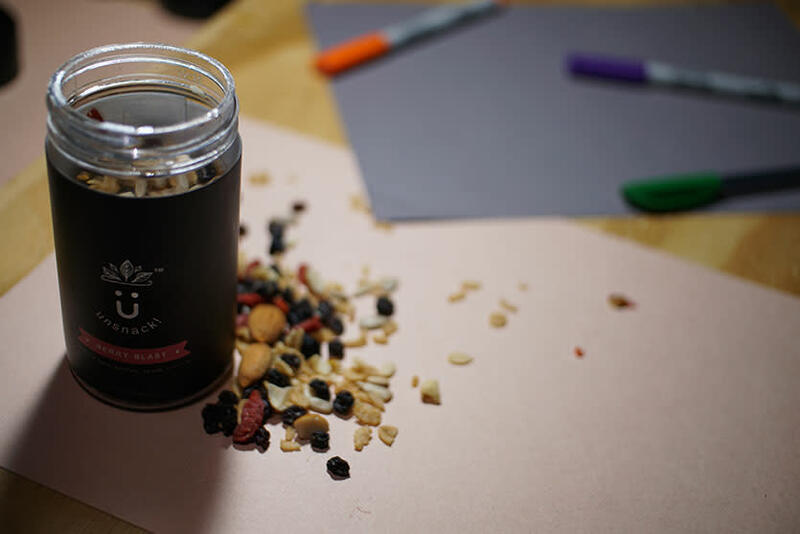 They have two varieties of food jars that’ve got nuts, berries and seeds and trust us, they’re both absolutely tasty! Unsnack basically aims to wean us off unhealthy eats and keep us on the straight and narrow by giving us healthy mixtures to munch on. 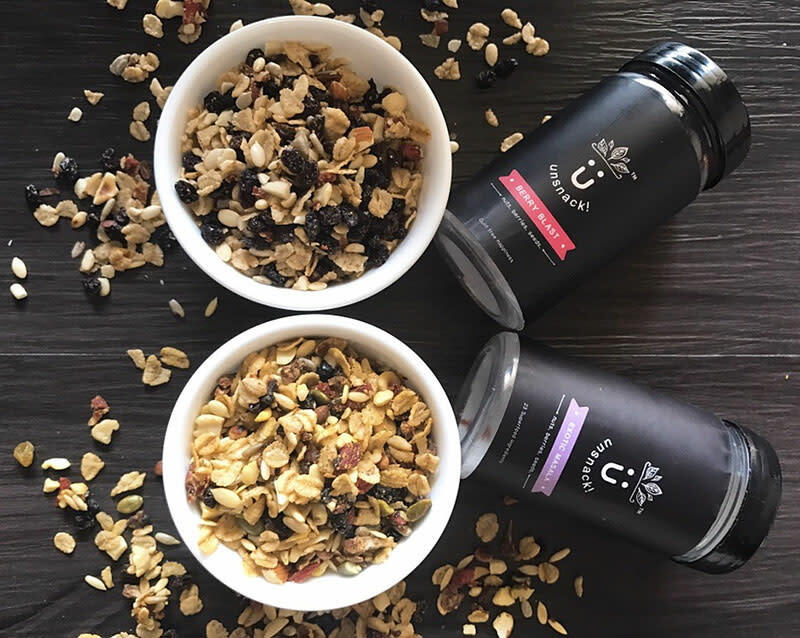 So keeping in mind our health and our never-ending love for yummy snacks, Unsnack has developed this range of healthy mixtures and we’re totally in love with ‘em! So Unsnack comes in two varieties - Berry Blast & Exotic Masala. The mixtures are basically 23 superfoods that include berries, nuts and seeds with no sugar or preservatives. They come in cute lil jars and are super healthy and super yummy! The jars have a mixture of food full of vitamins and minerals that help in boosting immunity levels, digestion, skin health and overall fitness. We’re personally in love with their Berry Blast variant as our never-ending hunger for something sweet will now be satisfied with goji berries, cashews, almonds, hazelnut, watermelon seeds, blue berries, black currant, dry mango, pine nuts and other healthy lil things that we couldn’t in our wildest dreams think of munching on! Here’s The Deal | The best bit? They’re giving a special 25% off on their products on Amazon just for you guys! All you gotta do is use the code ‘SUNSNACK’ and you can enjoy healthy-tasty goodness at amazing prices! So dump your chips, cookies, and everything unhealthy and un-snack your way into a healthier life with the nutrition dense mixtures from Unsnack. It’ll be your perfect late night companion, make for awesome evening munchies and of course - a perfect gift for your loved ones!